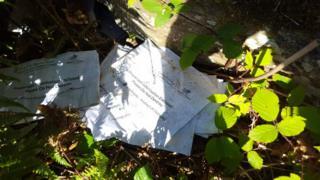 Hundreds of council letters advising residents of changes to household recycling have been found dumped on a hillside. The Blaenau Gwent council letters were discovered by Gary Jones, who was looking for his missing dog in neighbouring Caerphilly county. Mr Jones said he found them "crammed under rocks" in an area between Abertysswg and New Tredegar. The council said it had outsourced the delivery to another company. The letters, dated June 2018 and aimed at householders in Blaenau Gwent, were in envelopes bearing the words: "Important information enclosed - please do not destroy." Mr Jones, a 36-year-old father-of-two from Abertysswg, said: "It's scattered in places, but where it's concentrated it seemed to amount to about 100 or so letters. There's a lot of broken down waste in the area too which could be letters. "Ironically these letters were regarding improvements to their recycling processes." He said: "I would never have found this rubbish if I wasn't looking for my dog. I went into a lot of undergrowth and fell in a hole, and as I looked down I saw the letters crammed under rocks. "I only had to walk 50 or so metres into the area and it was just dumped there. In one area there were at least 100 under rocks, 30 or 40 along a path and another 100 or so in a crack - probably a car boot-full. "Fly-tipping is one of my top peeves, so to find that, I was pretty annoyed." Blaenau Gwent council said: "The council outsourced the delivery of letters to every Blaenau Gwent household to inform them of changes to its refuse collection service a number of weeks ago. "Blaenau Gwent is disappointed that a small number of undelivered letters seem to have been dumped by the distributor. "We have asked the company to conduct an urgent and full investigation into the matter and to collect the items from the area at their cost." Are fines the best way to tackle rubbish recyclers?